Tom Daintry, born in 1911, had an athletic career covering over 70 years of active competition. In 1925, Tom started his career as a sprinter when he was 14 at the South Sydney Athletic Club. One day he was induced by the club's walking champion to walk in the club's championship to make help up the field. After being ten minutes instruction he then went out and beat his teacher in the one and three mile walks. After this early success, he never looked back. At 15 years old he won the New South Wales junior championship and repeated this for the next 2 years. When he was 18, he represented NSW in the Australian Championships held in Melbourne at the MCG in 1930. He met with stiff opposition in the form of Bert Gardiner and Horace Wilson from South Australia. But by setting a cracking pace on the early laps, he was able to burn off the opposition. Bert Gardiner recalled the event: "I remember that well as I was disqualified when in the lead with South Aussie, Horrie Wilson, and he was also scrubbed. As we were under the world record on the third lap, we probably deserved it. In the late 1930s, as Australia was still in a world wide depression, Tom headed to the north of New South Wales to seek employment. With no competition or training facilities, Tom assisted in the formation of a club at Kyogle. But for top competition, Tom had to go to Brisbane each year and finally he made the move there. He then held all the Queensland Walking Championships for 23 years plus 2 marathon runs. Business reasons again dictated a relocation and in 1956 he moved to Melbourne. It gave him a chance to compete in the trials for the Olympic Games. Unfortunately due to lack of training and the building of a factory, he failed to gain an Olympic berth. It was at this time that he joined the Victorian Amateur Walking Club and quickly became one our our leading walkers. He was club captain for many years and his association with our club covered over 30 years as an athlete and club leader. I first met Tom when I started race walking in 1965. In those days Tom was already over 50 years of age but was still a fine walker and regularly shared the weekly style award with Bob Gardiner. My first Victorian representation was in 1973 when I made the Victorian team for the Australian 50 km championships in Queensland. Tom was the team captain at that age - at over 60 years of age. I am not aware of anyone representing their state at such an age. It was a great privilege to have had him as a team leader. Tom is one of the very few athletes who has represented 3 states. In the early 1970's Tom was one of 4 walkers who decided to start an Australian Chapter of the Centurions club. The 4 founders put up the money for the initial medallions and got the ball rolling. Tom was keen to become a Centurion himself and he tried on several occasions during the early seventies. He got to the 70+ mile mark but age was against him and he failed. It was a great disappointment for him. No doubt he would have done it easily in his prime. Tom worked in the wood industry and the Centurion Honour Board hanging in the VRWC clubrooms is a fine example of his work. It was hand crafted by Tom as a fitting medium for recording Centurion membership. The fine ingrained woods belie the fact that Tom was over 80 years of age when he produced it. As the Veteran Athletics movement gained momentum, Tom turned his thoughts to it and set new world standards in each age division as he worked his way up through the age divisions. At one stage, the Master Age Record Book showed Tom holding 16 world records for various distances from 5000m to 50 km. He travelled to a number of World Veteran Championships and regularly won his age group in convincing fashion. In the many years he competed, he was disqualified once. To quote Tom "The only disappointment in my sporting life was the only time I was disqualified by an ex-rival when only one judge was required to disqualify. I represented Queensland in the Australian Championships in New South Wales. He had spread the word two weeks beforehand that I and Don Keane would be put out. Which he did in the first 50 metres." However, the doyen of Australian athletics, Bert Gardiner, himself a great walker, rated Tom Daintry as the best stylist who ever won an Australian Championship. You cannot get any higher recommendation. 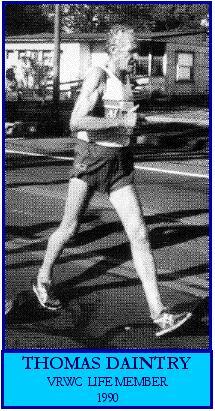 For his services to racewalking in Victoria Tom was made a life member of the Victorian Race Walking Club in 1990. In the early 1990's, Tom moved back to Queensland with Betty to be with his family. It was a great loss to Victorian walking as he had spent the last 40 years competing as a Victorian. He died quietly in the early morning hours of 4 September 2002, aged 91 years. For those of us who came under his influence, it was a great loss. Tom was not only an inspirational walker and a wonderful coach and motivator, he was a gentleman in every sense of the word. The Tom Daintry Trophy was instituted by Athletics Victoria in 1976 and is awarded annually to the best A. V. Under 14 First Year girl walker.